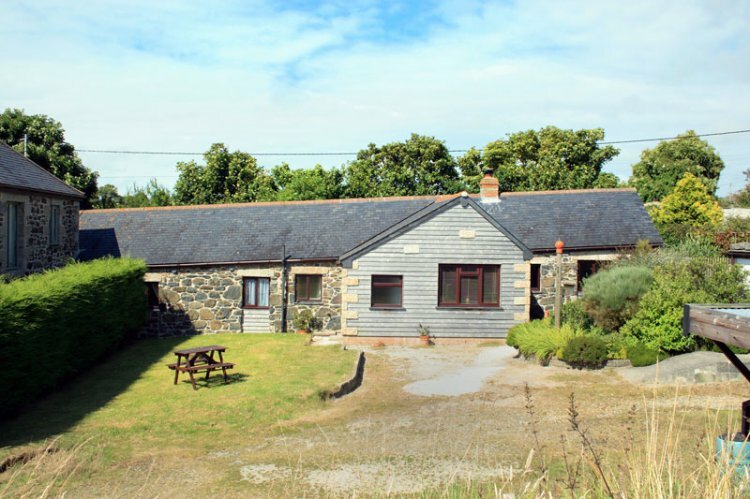 Anneth Lowen is a very comfortable and spacious barn conversion in Cury, Nr Mullion, Cornwall. With vaulted high ceilings throughout, exposed beams and log burning stove, but not without modern comforts such as central heating and double glazing. Being set well back from the quiet country lane, Anneth Lowen provides a peaceful location as well as a safe haven for children to play outside without risk of traffic. Entered into the tiled utility area with cloakroom off, coat hooks and washing machine, leading through into the kitchen. Well-equipped with its tall fridge/freezer, dishwasher, microwave, electric oven and hob with extractor over. Off the kitchen is the snug area, a quiet place to read on the three seater sofa provided or enjoy a glass of wine while someone else prepares the dinner! Dining room has an extending table with four chairs, stereo and a stable door out to the garden. Lounge is very spacious with comfy seating for four people, coffee table, 32" TV with freeview and DVD player. A log burning stove in the hearth is for your use and the first basket of logs is provided free. An assortment of games and puzzles is also provided. Outside is ample parking and turning for two cars, a front lawned area with picnic bench, small secluded patio with garden furniture and a separate rear lawn. Rental includes bedlinen, gas, electricity, central heating and first basket of logs. Up to two dogs welcome by prior arrangement at £25 per week per dog. Regret no smoking. While the accommodation is predominantly on one level there are one or two internal steps between rooms.